The Natcom IRB300 is a defense & security vehicle intercom system for crews such as those deployed in battle tanks or APC vehicles. With added peripherals such as radios, loudspeakers, headsets & handsets, the system performs as a central communications hub. The intercom provides a conference facility that allows the distribution of clear commands and voice communications within the high noise environment (when used in conjunction with Acoustic Noise Reduction Headsets.) All crews can communicate over the Intercom whilst simultaneously monitoring the Combat Net Radios (CNR). 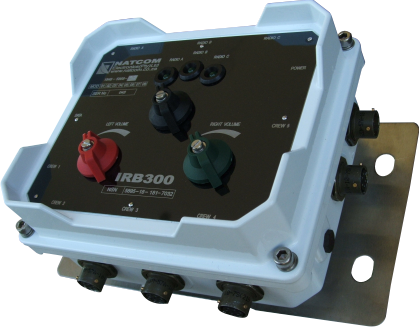 The IRB300 also interfaces to Data Terminals and Data Radios.